A perceptive, occasionally slow-reading mix of history, personal narrative, and cultural criticism tries with great (though not complete) success to analyze the role race and money play in America’s most intractable social problems. Researching the history of his adopted northeast Florida home, Rymer (Genie: An Abused Child’s Flight from Silence, 1993) encounters suspicion as a white journalist interested in black history. 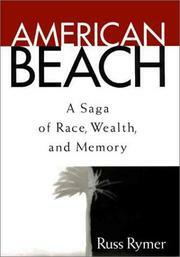 His interest is largely explained by the fact that he sees the rise and fall of American Beach, one of the country’s few black resorts, as exemplary of the problems faced by American society as a whole. The longest of the three overlapping stories, “Ancestral Houses,” examines the life of A.L. Lewis, Florida’s first black millionaire and a towering example of a type long disappeared from the American scene: a businessman who melds morality and commerce. As the founder of the Afro-American Life Insurance Company and the architect of the planned community of American Beach, Lewis was the moral and financial pillar of his community. After his death, both company and community disintegrated. Rymer—who sees this sad tale as an example of the tragic arc of US (rather than exclusively black) history—brackets that story with two related narratives. The first details the death of a troubled black man at the hands of white policemen, and the tensions it causes. The second contrasts Disney World’s nostalgic Celebration community with the real-world battle for autonomy waged by Eatonville, the nearby hometown of Zora Neale Hurston. Throughout, Rymer’s conviction is that American society has been rent by a central problem throughout history: our ability to “dichotomize” our lives between business and morality. He’s at his best as a reporter, allowing his subjects to spin their own tales. At times his social commentary (his comparison of Disney’s utopian Celebration community with the ideals of the Harlem Renaissance, for example) overreaches. Despite flaws, a provocative, smart, and often withering look at American culture.